Andrzej Panufnik was born in Warsaw on 24 September 1914. He was a son of a well-know violin maker and began composing at the age of nine. After completing his theory and composition studies at the Warsaw Conservatory (1932-36), he continued music education with Felix Weingartner (conducting, 1937-38) at the Vienna Academy of Music; he subsequently studied in Paris and London (1938-39). He spent the wartime years in Warsaw, appearing as pianist at legal charities as well as illegally organized concerts. He formed a piano duo with his friend, composer Witold Lutosławski (1913-1994); together they performed a number of two-piano arrangements of works from standard repertoire. Only Lutosławski’s “Paganini Variations” remain from this bulk of music. After the war (in 1945-46) Panufnik served as the conductor of the Cracow Philharmonic Orchestra and (in 1946-47) director of the Warsaw Philharmonic. 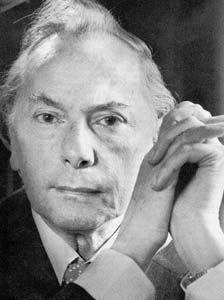 Widely regarded as the most important Polish conductor/composer, Panufnik was invited as a guest-conductor to Germany (Berliner Philharmoniker), France and England (London Philharmonic Orchestra). In 1950 he was appointed vice-president of the UNESCO International Music Council. In 1953 he was head of the official Polish cultural delegation to China, where he was personally received by President Mao. Panufnik’s early scores were burnt during the Warsaw Uprising (only three of them were later reconstructed). In the post-war years Andrzej Panufnik won many awards at domestic and foreign competitions for composers: First prize at the Szymanowski Competition in 1947 (for Nocturne), First prize at the Chopin Competition in 1949 (for Sinfonia rustica), First prize at the Helsinki Olympic Games-related competition in 1952 (Heroic Overture). In 1949 he received highest state distinction of the Polish People’s Republic – Order of the Banner of Labour of the First Class, in 1951 and 1952 was winner of State Prize. As he could not come to terms with communist-imposed constraints on creative liberties, he decided to remain in London where he traveled on official business in 1953; he continued his conducting career as head of the City of Birmingham Symphony Orchestra. In 1959 he withdrew from this position to commit himself entirely to composing. Among the various honors that he received, he twice won the Prix de Composition Musicale de Monaco, in 1963 (Sinfonia sacra) and in 1983 (for all his artistic work). Panufnik received the Sibelius Medal of the Century in London in 1965 and in 1984 was granted Honorary Membership in the Royal Academy of Music in London. In 1987 he received Honorary Membership of the Polish Composers’ Union (from which he was exluded in 1954 after his departure for England). His pieces were not performed in Poland till 1976 and his name was blacklisted – it could not appear in dictionaries, press reviews, books or any other publications. In 1987 Panufnik published an autobiography (pub. Methuen) entitled “Composing Myself.” In 1990 he was granted a prize of the Polish Minister of Foreign Affairs for his contributions to Polish culture. In the same year after the 36-year-absence, he visited Poland at the invitation of the “Warsaw Autumn” Festival as its honorary guest. The program included 11 of his pieces, three of them performed under his baton (Symphony No.10, Harmony and Violin Concerto). In 1990 he was honoured with the British nobleman’s title “Sir”. Panufnik died at Twickenham on 27 October 1991. His wife, Lady Camilla Panufnik is a renowned photographer, his daughter Roxanna Panufnik and son are composers.